People who work in physical, dangerous jobs like construction or oil rigging are not the only ones at risk for a workplace injury. To a certain extent, the average office worker can also be at risk for bodily harm. Repetitive strain injuries (RSI) are a type of ailment (invisible condition) that occur as a result of, well, repetitive strain. Constant, repeated motions that involve relatively little effort or energy can take a steady toll on the body, eventually leading to chronic pain conditions referred to as RSI’s. RSI’s are one of the most common ergonomic injuries incurred in the office. To prevent office related RSI’s, always remember to do the following. Watch your posture and positioning while sitting or standing for long periods of time. In addition, remember to take breaks when necessary, and change position every 30 to 60 minutes. Merely shifting from sitting to standing every 45 minutes can significantly reduce the risk of injury. Use ergonomic devices wherever you can. For specific workspaces and accessories, this may not be feasible. A small desk may not have room for an external keyboard plugged into a laptop through USB, for example. Wireless keyboards and external monitors could offer a solution. Recognize small RSIs before they become big ones. The sooner you take corrective action, the less likely you are to develop grave and lasting injuries. In short, RSIs are caused by repetitive motions or awkward positions sustained for long periods. When not properly treated, these minor injuries can become severe and require intense treatments like physical therapy to alleviate them. Being aware of the ways you can develop repetitive stress injuries can go a long way toward preventing them from happening in the first place. What Are Repetitive Stress Injuries (RSI)? Repetitive stress injuries or RSIs (also referred to as repetitive strain injuries or work-related musculoskeletal disorders) are injuries to the nervous and musculoskeletal systems. These result from sustained or awkward positions, mechanical compression, vibrations, forceful exertions, or repetitive tasks. One of the most common repetitive stress injuries is carpal tunnel syndrome. Carpal tunnel syndrome occurs as a result of continued use of the wrist and fingers. Most often, people who spend a lot of time typing at their desk are at risk for developing carpal tunnel. Thankfully, there are a number of solutions to cope with and prevent carpal tunnel syndrome. To prevent carpal tunnel syndrome from developing in the first place, your hands, wrists, and forearms should be level when typing. They should create a horizontal line, or as close to it as possible. You can accomplish this position by adjusting the height of your work desk and keyboard accordingly. Another preventative factor that prevents such condition is to use an ergonomic keyboard and mouse. 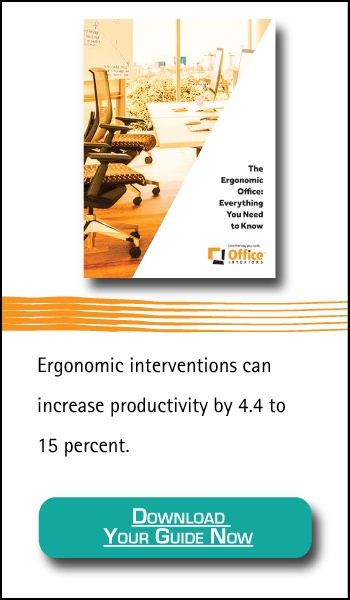 Ergonomic devices are designed in such a way as to help reduce strain on the muscles in the hands and wrist. Because RSIs result from long-term repetitions of small, low-stress movements, reducing the pressure on the muscles involved by even a tiny amount can make a noticeable difference. For those who have already begun developing carpal tunnel, compression sleeves are a viable option. They are like thin gloves designed to restrict movement to a certain degree. While slim, medium-compression sleeves work well for minor cases, more severe cases might require high-compression sleeves. It’s common for athletes who put their forearms under intense strain to wear more heavy-duty compression sleeves such as those with copper lining for increased support. These can work for the office worker who finds him or herself suffering from carpal tunnel, too. Lower back pain is another common RSI. Lower back pain most often results from sustained or awkward positions. It’s essential for your chair to have adequate lumbar support to prevent slouching. Chairs without support for the lower back result in a bending of the natural curvature of the spine, which can cause chronic pain. Over very long-term periods, more severe problems can result as well. To mitigate this risk, look for task chairs with adjustable lumbar supports built into the backrest. Want to learn more about ergonomic injuries such as RSIs or the tools and strategies you can implement to prevent ergonomic injury? 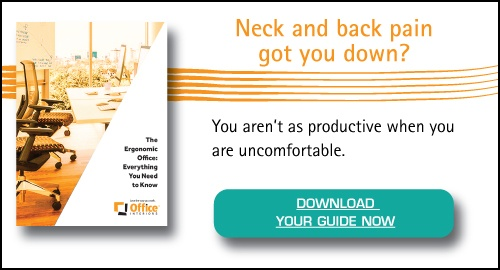 Download our Guide to Office Ergonomics today!